Dutch artist Hanneke de Munck scraped out a piece of driftwood to make it into a primitive field shrine. To this shrine she tied the sculpture of a young desperate girl, cut from purple wood from South America. The girl seems somehow to have washed ashore after she fell into the water. I saw the sculpture in a gallery as part of the exhibition ‘Devoted Art: 12 Modern Altarpieces.’ Immediately I was drawn to it. And when I read the poem by which the work was inspired, its appeal only increased for me. due to a shortage of oil. The poems in Narek, which means ‘calling out plaintively,’ all start with ‘words to God from the depth of the heart.’ They invite the readers to open themselves in prayer and contemplation to a meeting with God by reading the text out loud. Also the girl of purple cries out, huddled with hands spread around her face in despair, floating on a piece of wreckage. She is one of those who have lost hope of rescue. She reminds one of The Scream by Edvard Munch. Gregor Narekatsi talks about ‘those whose lamps are extinguished due to shortage of oil.’ It contains a reference to the parable of Jesus about the wise and foolish virgins (Matthew 25:1-13). This story tells about ten young women, who set out to meet the bridegroom before the wedding starts. But the bridegroom is late in coming and they fall asleep, until someone calls them that he is about to arrive. Then it turns out that five of them are short on oil and the other five refuse to share theirs, as then there may not be enough to light the way to the place of celebration for any of them. When the five have bought new oil and arrive at the feast, they find the door closed and there is no response to their call. For them it appears to be too late. But does it appear too late or seem too late? That is what I have always wondered. Can it ever be too late for God, the Alpha and Omega, who embraces time like the wooden shrine surrounds the girl – like a lifeboat? Is it possible with God that the one is saved who has just enough fuel for herself, but too little to take another in tow and that then the other is lost? It is true, when you give too much away of your energy, you may get burnt-out and no one wins. But does this not make clear how powerless the wise women are as well? Who can celebrate when their neighbour misses the boat? Would that not mean that we all end up in a world of everyone only looking out for themselves? I was glad that I saw the sculpture in the gallery against a warm wooden wall and not in the World Trade Center in Amsterdam, where it was shown in 2011. In a photo of it I saw how lost it stood there amidst the hard business world of industrial design and glass. Context makes a powerful difference. The same is true for the story of the wise and foolish. Matthew places it in the context of Jesus’ words about the last things, the end of days, when it is decision time and there is no more room for nuances. ‘Keep awake therefore, for you know neither the day nor the hour,’ Jesus warns at the end of the story with a call to stay alert. 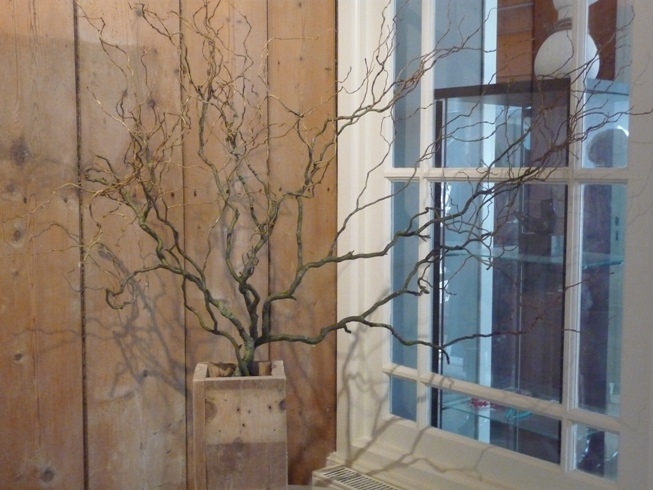 In a wooden vase besides the sculpture stood an Easter branch, a bare willow branch, seemingly lifeless, but a little water and warmth would be enough to make it revive. Wood has a comforting quality, as life remains in it during the cold of winter. The wooden boards behind the purple-numbed girl in her shrine made me think of the wall of a ship, the grey blue of the tiles and the blue reflex of the window of the sea. I looked back to the sculpture. The wooden shrine enfolded the crouched purple girl like a rescue boat and the rope firmly latching her to it became a lifeline. Hanneke de Munck: Narek, 2007, wooden block washed up on the island of Schiermonnikoog, in the north of The Netherlands. Its length is about 175 cm; tied to it is a sculpture from purple wood. After the Book of Lamentations by Narekatsi, a 10th-century Armenian poet and monk. Hanneke de Munck (1951) is a Dutch artist, who studied at the RoyalArtAcademy in The Hague and the Rijksakademie in Amsterdam. Since 1983 she has worked as an independent artist in Amsterdam and since 1995 she has taught at the innovative art academy at the NDSM-Wharf in Amsterdam. In her work Hanneke de Munck uses different techniques and abstracted figuration based on the classical tradition, so lovingly instilled into her by her teachers. The essence of a work comes first, her language of shapes and her choice of materials and technique come next. De Munck’s latest love is wood. She has a collection of tree trunks out of which new series have come forth in interaction with the material. Travelling through Slovakia in 2003 Hanneke de Munck was very much impressed by the 15th-century altar pieces she saw there – combinations of wooden sculptures, relief and paintings. They inspired her to collaborate with other artists to make twelve contemporary altarpieces, which create places for religious contemplation and devotion and are devoted to important human values, to things that in our time are still experienced as holy. José Verheule is a theologian based in Zaandam, NL. She has worked as a minister in the ProtestantChurch in the Netherlands.